Even though he’s commonly known as Peter Sagan’s most reliable domestique, it was his star that shone brightest in the marked by bad luck and controversies last Tour de France edition. Maciej Bodnar spoke with us about his career’s biggest victory, building a World Champion-worthy team for cobbled classics and whether Bora-hansgrohe stands a chance to become the new Sunweb. He seemed ever so slightly embarrassed while standing on the podium in Marseilles, but turned out to be a very relaxed and eloquent interlocutor. Bora-hansgrohe first season in the WorldTour ranks was undeniably marked by bad luck, but the 32-year old Polish rider positively assessed his role in the spring classics campaign. In the end, it was a good season. Obviously, winning that Tour de France stage has been its biggest highlight, but classics went pretty well too, despite being struck by a huge portion of bad luck. I was doing well everywhere I was supposed to. At the same time, Bodnar admitted that even though the stage win at the Tour de France was by far the biggest triumph in his career, it had a slight impact on the perception of his person compared to more recognizable Polish riders, Rafał Majka and Michał Kwiatkowski. Between the lines it was rather easy to read that this state of affairs does not bother him at all. Tour de France has such a huge media coverage that it could be felt [an increase of interest], but it hasn’t affected my everyday life. Tour de France has a worldwide coverage, but as I said, that victory hasn’t changed my life, while I consider an increased media interest as a secondary issue. Then we smoothly moved to the plans for the upcoming season. As it turned out, Maciej’s race programme, even though similar to those he followed in recent years, will have one significant change. The programme for the upcoming season does not differ too much from those I followed in recent years. I have a very good calendar, in which the biggest change will be kicking off the season in Australia. I participated in the Tour Down Under twice in the beginning of my professional career, but I haven’t been there ever since. Later on, I’m going to follow a well-known programme, which consists of an altitude camp in Sierra Nevada with the classics squad, Tirreno-Adriatico, whole cobbled classics campaign alongside Peter Sagan and Tour de France. Does it mean that both Rafał Majka and Peter Sagan will participate in the next Tour de France edition? It has been already announced that Rafał will be our Tour de France leader, but it’s not my role to confirm Peter’s participation. It’s very likely to happen, though, as Giro d’Italia doesn’t drive similar media interest. The first big objective of the German team, however, will be the spring classics campaign, in which Peter Sagan will enjoy a support of the strongest team he’s ever had. “Bodi” admitted that he expects latest transfers to turn Bora-hansgrohe into one of the strongest squads for one day races. Signing of Daniel [Oss] is a game-changer for us. We had a lot of bad luck as a team last season. Hadn’t Peter crashed during the Tour of Flanders, everything could have panned out differently. We will never know if Gilbert would have made it to the finish line and hadn’t that crash happened, our spring campaign would have been rated much higher. Speaking of Daniel, in Paris-Roubaix he followed the action which Peter and I had initiated and continued solo until being caught 15 kilometers from the finish line, so again, things could have been very different for us, hadn’t yet another crash happened. In the end, however, I think it’s better to focus on the future and next year – with all squads narrowed down to seven riders – we should be considered one of the driving forces in the classics. I don’t want to emphasize my own contribution, but with Daniel, Peter, Marcus Burghardt, some young riders like Lucas Postlberger and more experienced ones, like Aleksejs Saramotins, we should be very strong. Also young and fairly unrecognizable riders give their very best and step up to another lever while working for the World Champion. We can expect a lot from them. The reinforcements made, to some extent at the expense of Greg Van Avermaet, will not only significantly increase the chances of the World Champion in the next clashes with the 32-year-old Belgian, but also boost the team’s ambitions in the team time trials. 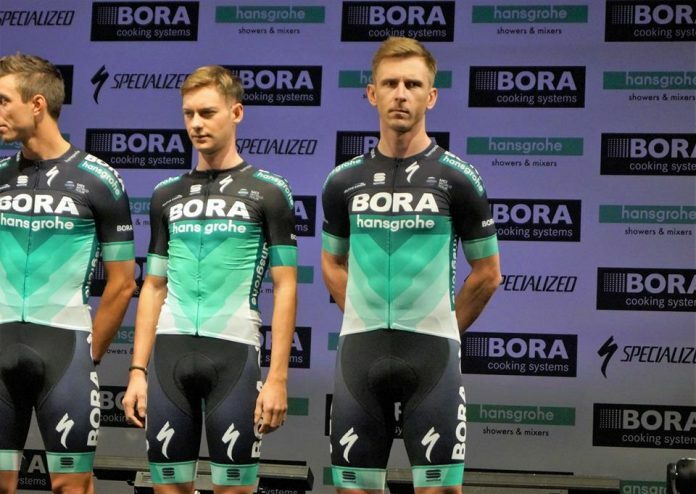 Does Bora-hansgrohe have a chance to become the next Sunweb? The team want to focus on it [team time trials]. Team headquarters are located not too far away from Innsbruck, so we will target a podium in the World Championships. A victory might not be within our reach just yet, but on the other hand Sunweb have proved that nothing is impossible. And what about his own ambitions? I’m going to target all time trials. The team promised me I would be released from my duties and allowed to rest one or two days before time trial stages. I’m going to fight for more victories. It’s important for me to start the season better than last year, when I struggled to find the right rhythm in time trials up until the national championships. The 32-year old also admitted that even though the stage victory in the Tour de France hasn’t turned his life around, it has filled him with self-confidence. It didn’t have much to do with having a good day. I worked hard with my trainer [Patxi Villa] and it eventually payed off, but when I learned that only Alberto Contador clocked a better time on the climb, it boosted my morale significantly. I was recultant to admit it back than, but I knew that that steep climb in Bergen, despite being really hard, couldn’t hurt me. Now I’m confident that as long as I stay focused, I can negotiate reasonably short climbs quite well.